We help businesses achieve full PCI compliance certification. The Payment Card Industry Data Security Standard (PCI DSS) compliance ensures that businesses that conduct credit card transactions have measures in place to protect their customers from card theft and incidences of fraud. If you run a business that accepts, transmits, or stores customer card data, then you must have PCI DSS compliance validation from major card brands such as Visa, Discover, American Express, and MasterCard. PCI DSS compliance is managed and administered by the Payment Card Industry Security Standards Council (PCI SSC) which was launched in 2006. The compliance applies to all companies and organizations that handle cardholder data, notwithstanding the number of times the customer conducts a financial transaction using the data. It is important for both small and large businesses to have PCI compliance to avoid penalties. We help businesses develop PCI DSS compliant payment solutions to not only avoid penalties but to increase customer trust and confidence as well. 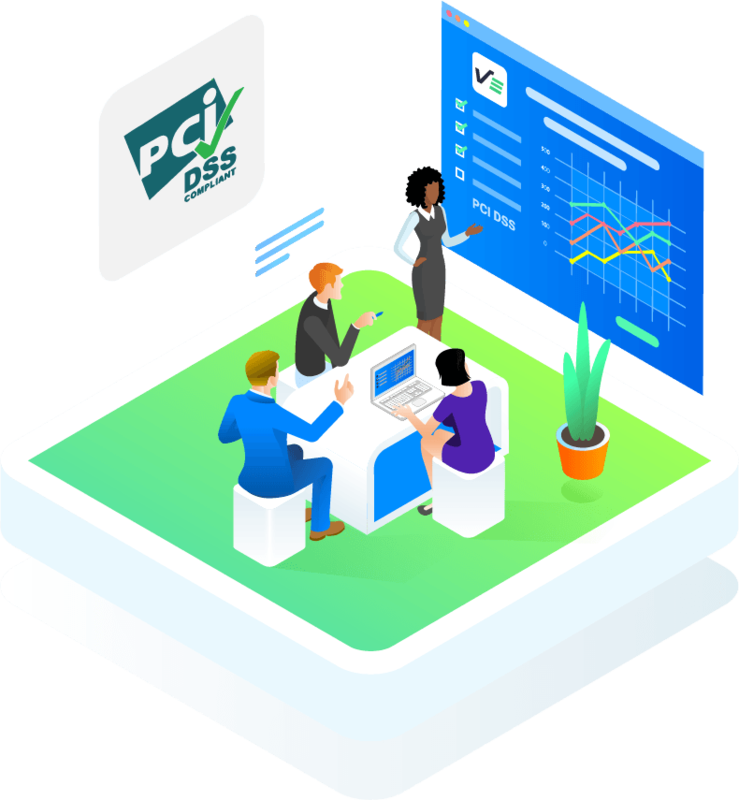 Our PCI compliance experts will work with your IT team to implement the required policies by identifying cardholder information risks and providing you with expert guidance to avert the risks. Learn about Venkon’s PCI penetration testing and ensure that your company’s payment systems are in compliance with the PCI Data Security Standards. If your business accepts, transmits, or stores customer card information, then you are required to have PCI DSS compliance validation from leading card brands such as MasterCard, Visa, Discover, and American Express. This compliance is administered and managed by the Payment Card Industry Security Standards Council (PCI SSC). This is an organization established in the year 2006 to provide a regulation on how businesses use and store customer card data. PCI DSS compliance applies to all organizations, businesses, and companies that deal with cardholder data, regardless of the number of times the customer has conducted business with the company using the card information. It is, therefore, important for all companies, whether small or large, to ensure that they have PCI DSS compliance or risk hefty penalties. How can Venkon help my business to achieve full PCI DSS compliance? At Venkon we’ve helped many businesses achieve full PCI compliance certification. We’ll help you to develop PCI DSS compliant payment solutions that will not only help you to avoid the heavy penalties of non-compliance but increase customer trust too. Our expert PCI compliance experts understand everything needed to ensure that your business conducts credit card transactions with the right measures to protect cardholder data in place. The ultimate goal is to give you airtight security and demonstrate that your system is safe from card theft and fraud incidents. Do you work with our team to achieve compliance? Of course. We work hand in hand with your IT team to implement the necessary policies as required by the regulating body to ensure that your cardholders’ data remains secure always. We’ll provide your IT team with expert guidance in every step of the way. Is PCI compliance enough security? PCI compliance alone does not necessarily mean that your system is completely secure. The standard is basically a minimum-security requirement that a business must have to securely process, store, and transmit cardholder data. Compliance is only a proof that you have satisfied the minimum requirements but not that your business is completely secured. Do you provide PCI penetration testing services? Venkon provides PCI penetration testing services to ensure that the payment systems used in your business comply with the PCI Data Security Standards. Most of organizations and businesses are not aware that PCI DSS Requirement 11.3 and requirement 6.6 compliance actually require a penetration test to be done to confirm that the company’s cardholder data processing and storage system is 100% secure. This is an extra level of testing beyond the external and internal vulnerability test that is mandatory for PCI DSS Requirement 11.2 compliance. Who is this PCI DSS compliance service for? This service is for any business or organization that handles every type of payment cards. It is designed for a just about every business and organization today including SMEs, financial institutions, software and hardware developers, online and offline retailers, and point-of-sale retailers in any industry.